Just a few minutes away from the Alexanderplatz, between Greifenhagener Straße and Schönhauser Allee, in close proximity to the Helmholtzplatz and the "Schönhauser Allee Arcaden" shopping mall, lie the ensemble of buildings that make up the "Gethsemane-Höfe". 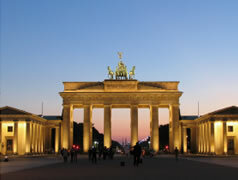 Optimum access to the public transport network by underground (U-Bahn) and urban train (S-Bahn) or tram, journeys to Berlin Mitte are short - from Alexanderplatz to the Brandenburg Gate. Due to the mostly renovated Wilhelminian style buildings this Berlin borough today has a lively culinary scene and many green parks, and is mainly populated by well-educated young people, families with children as well as artists and creative people. Discover the area with Google Maps as a street map, satellite photo or route planner for the perfect arrival.